The Apache OpenNLP library is a machine learning based toolkit for processing of natural language text. It includes a sentence detector, a tokenizer, a name finder, a parts-of-speech (POS) tagger, a chunker, and a parser. It has very good APIs that can be easily integrated with a Java program. However, the documentation contains unupdated information. In this tutorial, I will show you how to use Apache OpenNLP through a set of simple examples. Before starting the examples, you need to download the jar files required and add to your project build path. The jar files required are loaced at "apache-opennlp-1.5.3-bin.zip" which can be download here. Unzip the .zip file and copy the 4 jar files in the "lib" directory to your project. In addition, you will need to download some model files later based on what you want to do (shown in examples below), which can be downloaded here. Hi. How are you? This is Mike. sentence detector returns an array of strings. In this case, the array has two elements as below. By its name, name finder just finds names in the context. Check out the following example to see what name finder can do. It accepts an array of strings, and find the names inside. Chunker may not be a concern for some users, but it is worth to mention it here. What chunker does is to partition a sentence to a set of chunks by using the tokens generated by tokenizer. I don't have a good example to show why chunker is very useful, but you can replace the sentence with your own sentences in the following example code, and try to generate something you like. Even though the documentation is not good, some part is still useful from OpenNLP official site. How to determine if a string is English or Java code? I want to extract amount in the invoice, i used OpenNLP -> “en-ner-money.bin” module its working only when amount with $ symbol. It’s not working for any other symbol. Is any way is there to extract total amount by providing key or proper module. Please help me in this problem. You should use opennlp.tools.parser.Parser and then the same for opennlp.tools.parser.Parse. It should work. I’ve added all jar files to the build path.Is there anything else i should add? why does my code show error when i use the parse() example? I think the parser’s result is wrong. 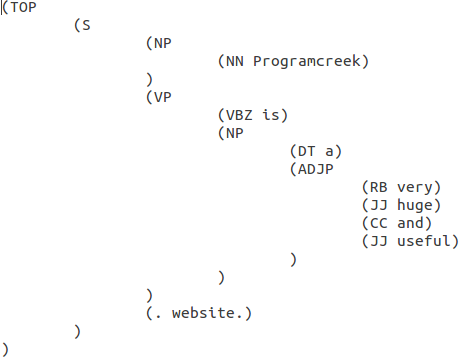 Check out this online parser http://nlp.stanford.edu:8080/corenlp/process. in 6.parser, why last word in sentence(website) isn’t classed as NN? why last word isn’t classed as anything? I’m trying to parse a resume/CV .first step to do i will separate the different parts of my CV: Personal informations,education , skills , inerests …. so to do that is it right to use the Parse Tree of OpenNLP to make sure that the different part are separated and the text that exist after is the value . your model file was not properly downloaded. yes. you need to download appropriate stopwords file and using this file words as stopwords and remove from your parser o/p. may be its helpfull you. meto hav same problem if u find any solution? Nice tutorial. Made it easy to use opennlp. Could you please specify how to use categorizer? How to create model for that. Just a petite example. this is my program.but i am not able to run this because of the errors below. "please help me to solve this"
please help me to use opennlp please guide me step by step. or any of the above what should i do to get it work..
Hi,Not able run by tomcat,but its working from main method which run by eclipse. I’ve downloaded apache-opennlp-1.5.3-bin.zip file. I’ve also copied all the 4 jar files into C:Program FilesJavajdk1.7.0jrelibext directory on my machine. PLEASE HELP ME RESOLVE THIS. MY DOCTORAL RESEARCH WORK IS STUCK HERE. Hi, we are trying to design a grammar checker using machine learning for which we need the POS tagger and parser functions of OpenNLP. But it keeps giving the exception : Usage: POSDictionaryWriter [-encoding encoding] dictionary tag_files . We cant figure out what the problem is !! Please help us . Yes, OpenNLP can run on windows. hi..what are the basic requirements for opennlp?can it run on windows7 32bit or not? I have started learning Open NLP and curious to know that once we have POS Tagger , can we get its corresponding English sentence back ? OutPut string: Hi. How are you? This is Mike. Any help or pointers is highly appreciated. Anybody have any files relating to conll2003 NER (Named entity Relation) . Would be great to see how to parse with the latest OpenNLP version. Seems like the ParserTool has gone missing. Hi! how do I include the models in netbeans. The classes are not recognize like SentenceModel and SentenceDetectorME. tnx! Hi, from the parser output i want to remove stop words because i want to get only meaningful words, is there any way to do this any aip? For No 6. Parser, how do I write the output (p.show()) to the textfile? I don’t think OpenNLP can do that. But when you parse the sentence, you get a tree. Then you may form the clause you want by defining your own rules. please help me to do this work? Models are learned from training data, and then used to process new data. what are the model files used for? hi…thank you for this tutorial. Yes, findName() should print range. findName() prints the following output , is it correct?…. – Do I need to provide a tag dictionary? Is there a default tag dictionary? Thanks so much for posting this! I really appreciate it. In the first example, with sentence boundary detection, why is “Hi. How are you?” shown as 1 sentence? Is this a bug in the program? Is it possible to post here the source code or email it to me? Thanks! The documentation over at SourceForge is outdated.